Nina, a young woman, is a photographer working for a newspaper. She lives in a house with Froumine, an old widower. Nina’s parents divorced when she was 6 years old and she has been raised by her grandparents. Her grandfather, Olek, also a photographer, used to spend hours photographing her, being very demanding from himself and from his model. Nina’s talent developed under his influence. Pictures exert over her a peculiar fascination. She has the knack to bring them to life, through her imagination. One day, developing photos she has taken in a street incident, she comes across a shot of a young man, with a mesmerizing stare, whom she has not seen before. She enlarges the photo. Through an irrepressible impulse, she starts looking for him. The search turns into an obsession. Though she knows nothing about him, she feels she must find him, otherwise she’ll die. Nina’s relationship with Froumine, the images she photographs and the faded pictures of her grandfather and grandmother when they first came to Palestine, are secondary line stories woven into the main narrative of the film: Nina’s quest for the young man. Through them we get small glimpses of the life in Palestine before the state of Israel was born. The film is about our desperate need for love. Nina yearns for the same unselfish love that ruled the lives of her grandfather and Froumine. A love that is absolute and unconditional. 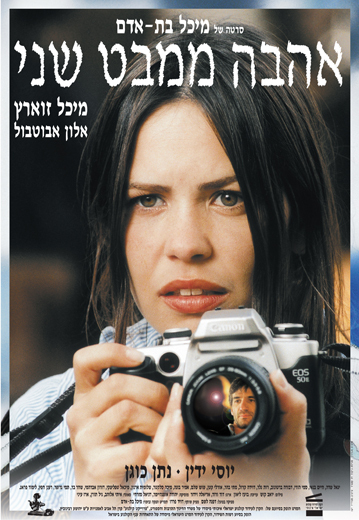 The film is also about photography, that magic thing which preserves for us our memories that we are made of.